Kevin is known to the world of recording as an expert engineer and producer. His list of Southern Gospel and Country Music hits is significiant. He also has an outstanding reputation for his expertise in producing award winning videos. Among the many awards bestowed on Kevin are Video of the Year 1987, a 1994 Emmy Award, 1997 Producer of the Year, 1997 Engineer of the Year, 1998 Engineer of the Year, 2000 Engineer of the Year, 2001 Engineer of the Year, and 2002 Engineer of the Year Award!! Kevin has engineered or produced numerous country music projects for artists such as Ray Price, Floyd Cramer, Clinton Gregory, Gene Watson, Billy Walker, Faron Young, Lorrie Morgan, Western Flyer and numerous others. He has also produced Gospel Music projects for most of todays popular artists including, The Crabb Family, The McGruders, The Lesters, Gold City, The Whisnants and the legendary Cathedrals, Hinsons and The Kingsmen…to name only a few! 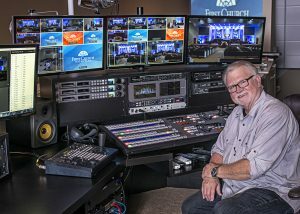 Kevin’s experience in live production dates back to 1974 when during his days with the Marshall Tucker Band he mixed FOH in venues such as Madison Square Gardens, Boston Garden, The Louisianna Super Dome, The Houston Astrodome, Denver’s Mile High Stadium, Atlanta’s Fulton County Stadium, Texas Stadium in Irving, TX, The Hollywood Bowl and others. His experience in the studio and producing events in enormous venues provides a backdrop for making the excellent choices for your multimedia needs.